Fabric & Construction: High-end, waterproof breathable fabric with membrane laminate. 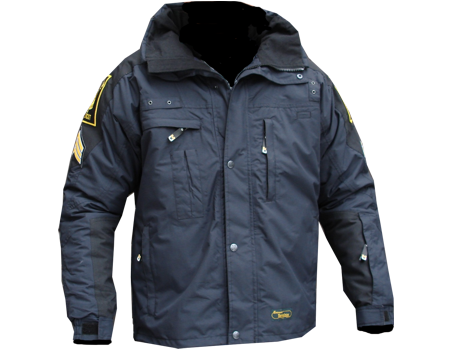 Abrasion-resistant fabrics in heavy wear areas. All seams double-stitched and taped (seam sealed). Choose from various fabric weights – heavy, mid, and light-weight depending on uses. All recommended fabrics have the same high waterproof-breathable standards – other fabrics available depending on function. Also choose your level of zip-out insulation. (optional). Functions: Design and accents built to look great, and functional panels to ensure comfortable fit and ease of use. Raglan sleeve cut – other option available. Coordinate your image and continue it from year to year as long as you want. Mid-length jackets are standard, with size zips and snap tabs for easy belt access. Optional snow/wind cuffs in sleeves and at waist. Soft brush, chin guard (optional). Extra-long front placket pocket that fits a clip board, or hat, etc. 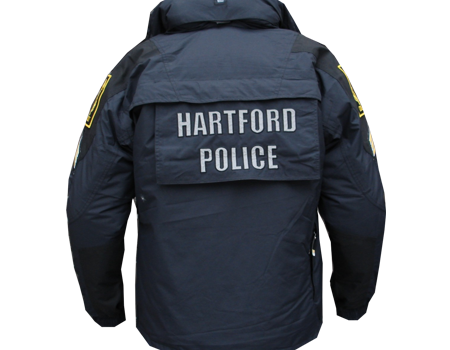 Zip-off or attached technical hood that tucks can into collar or stows in rear storage pocket. Other hood options available – call for details. Other options include radio pocket, radio mic tabs, convenient fore-arm pocket, and other well-placed storage pockets. Ventilation zips under arms with mesh. Name-tag Velcro or tabs, and/or badge tab attachment options. Choose what is best for you. Opt to have your patches and badges embroidered and production so they can be seam sealed. (Larger orders only). Many Reflective options available for larger groups that want to customize. Lining: Breathable Mesh with, 210T sleeves for warmth and movement is recommended to gain the most versatility. Available insulated (40-200 gram) or shell. Other lining options available. Accessories / Layering: Matching Softshell, Fleece or Windshell available in same colors and design. Look the same as no matter which layer is worn. Sizes: Available in sizes xs – 4XL depending on style and quantity per color. Colors: Choose your own color combination to create your own look for group buys. Add reflective or fluorescent color piping, or tape – with advance orders of 50 or more – call for details. Simple color changes of existing styles can be made with less quantity – advance orders still apply. For custom orders please call us to discuss; most items need to be ordered in advance to have time for manufacturing. Customize: Color your own panels with smaller orders, customize other features and even design changes with larger orders. Popular custom options are – choose your own length, reflective placement, special Embroideries or reflective appliques, type of hood (attached, detatched, etc.) , pocket specification, piping or accent options. Call for details. Item(s) shown are as customized by that customer. Let us know what you want. Contact us now for more information, and estimate, and know you can get the same item, in your preference of colors year after year, as long as you want.